Oh my gourd, it’s fall! These 10 Northern Michigan farms and markets offer tons of autumn activities for a full day of fun. Get lost in a corn maze, go on a wagon ride, sip hot cider (or hard cider) and leave with a car full of pumpkins. Royal Farms has pumpkins galore. Choose from pre-picked pumpkins or pick your own from the patch. They also offer U-pick apples, a corn maze, tractor-pulled hay rides, a gift shop and cider and wine tasting. Stop by the bakery to see what the pastry chef has been up to. Coveyou grows certified organic produce offering a variety in the Barn Market along with local artisan products. Pick pumpkins then go on a gorgeous hayride with views of Walloon Lake. 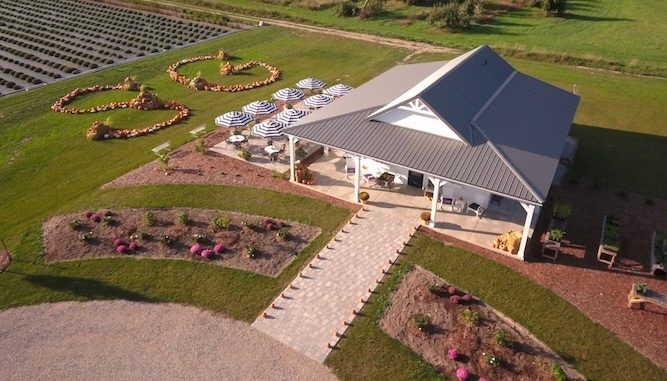 At Pond Hill Farm your family will find a U-pick pumpkin patch, hayrides, a squash rocket (fun for adults, too), lots of produce, a gift shop, picnic area, petting zoo and a winery/brewery. The list goes on! You’ll want to spend the entire day here. This family-owned and operated farm welcomes families and school groups in search of fall fun. They’ve got a corn maze, pumpkin patch, farm animals and a petting zoo. Plus, lots of goodies like pies, pastries, homemade jams, mustards, cheese, dried cherries, local wines, cheese, maple syrup and more. Hoxsie’s Farm Market has U-pick apples, pumpkins, squash and lots of fall decor items. In addition, there are educational class and group tours, wagon rides, an apple cannon and a corn maze. From classic orange to blue, pink, white and gray; warted, striped and multicolored; these pumpkins stand out in a crowd. Explore the patch, and enjoy spiced apple cider, pumpkin muffins and cookies. The gift shop (pictured below) is open too. Take your kids, friends and family to Jacob’s for the ultimate Northern Michigan corn maze experience. In addition to three corn mazes, including a kiddie corn maze, haunted corn maze and the incredible 10-acre corn maze, Jacob’s fruit/vegetable market offers U-pick pumpkins and apples, horse-drawn hay rides, a concessions stand and picnic area. Pahl’s is proud to use minimal chemicals and pesticides at their farm. Your kids will love picking their own pumpkins, the corn maze, a child-sized haybale maze, hayrides and the sweet farm animals. Pumpkins, wagon rides, harvest decorations and more await your family at Geers Farm. Try not to get lost in the straw bale maze, choose a pre-picked pumpkin or pick your own from the patch. You can walk out to the patch or ride the horse and wagon and get dropped off. Pumpkins are weighed on an old-fashioned scale and charged by the pound. There are also fun picture opportunities, farm animals to pet, and you can watch the Geers hand-make fresh donuts in the activity room. Have fun picking out your own pumpkin, squash or gourd at this laid back and fun family farm. Purchase straw bales and bundled corn stalks to outfit your home and take the kids through the corn maze. During the holiday season, Clark’s also sells Christmas trees. On Great Lakes Glass Pumpkin Patch Day, the first Saturday in October, Three Pines Studio in Cross Village is aglow with hundreds of handblown pumpkins made by renowned glass artisan Harry Boyer of Boyer Glassworks in Harbor Springs. In this MyNorth Media video, watch Boyer create one of the 600 pumpkins then follow videographer Kris Riley to charming Three Pines Studio where the colorful pumpkins “grow” in every nook and surface of this delightful gallery. Need help planning your Northern Michigan fall color tour?